ASTRONOMY: FROM THE EARTH TO THE UNIVERSE describes the current state of astronomy, both the fundamentals of astronomical knowledge that have been built up over decades and the exciting advances that are now taking place. The writing style is friendly and carefully detailed. 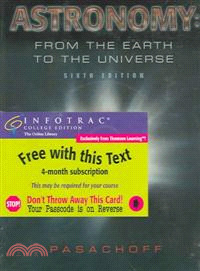 It serves as a valuable reference for both beginners and astronomy enthusiasts. This book is organized as a number of stories. Individual chapters often tell what used to be known, how space and other modern observations have transformed our understanding, and then what is scheduled for the future. This is done with each planet. Consequently, an instructor can easily add photos (available as slides, overheads, CD-ROMs, and on the World Wide Web) and movies and keep a student's interest for a whole lecture on each planet, if desired. Students learn about astronomy through concrete examples, rather than merely being given overarching concepts without enough underpinning.